Lucien Fontenelle (1800-1840) – The son of a wealthy New Orleans family, Fontenelle was born on October 9, 1800. He left home when he was just 16 years-old and entered the fur trade. Trading among the Omaha and other Indian tribes, he initially worked primarily about river posts like Bellevue, Nebraska. He later worked for the Missouri Fur Company and married an Omaha Indian girl named Bright Sun. The couple would have a son named Logan, who would later become an Omaha Chief. 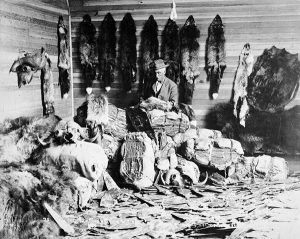 In 1825, partnered with Joshua Pilcher, and they, along with several other trappers set out for the Rocky Mountains. The expedition; however was not profitable, and Fontenelle returned to Belleview in 1828, while Pilcher remained in the mountains. He bought Pilcher’s interest in the trading post which then became known as Fontenelle’s Post. he then became affiliated with the American Fur Company and for the next decade he made yearly trips to the Rocky Mountains for the fur company. In 1832, he sold the Bellevue site to the government for use as as the headquarters of the Indian agent to the Omaha, Pawnee, Oto, and Missouri tribes, but soon built a new home and trading post just a few hundred yards down the Missouri River. During his lifetime, he was acquainted with several other famous mountain men, including Kit Carson, James Bridger, Thomas Fitzpatrick, Milton Sublette and countless others. At some point, he contracted cholera and was treated by Dr. Marcus Whitman. Towards, the end of his life, though he continued to operate his trading post, alcohol and personal problems began to wear on him. He died at Bellevue, Nebraska in about 1840, attended by Father DeSmet and was buried on the bluffs overlooking the Missouri River.